With 4,200 crystalline lakes and 27,000 miles of blue-ribbon, fishable streams, Wyoming is the ultimate fishing and fly fishing destination. Expert anglers and eager beginners alike can find a fisherman’s dream along the clear waters scattered across the state. Wyoming embraces this gift, ensuring that capable guides and outfitters are as plentiful as the fish waiting to be caught. 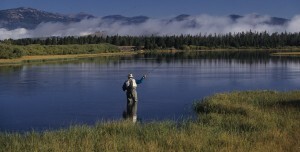 Yellowstone is perhaps the most famous fishing spot in the state, with anglers drawn by the legendary trout in its rivers. Brook trout, brown trout, rainbows and native cutthroat trout beckon to enthusiasts. Farther south, in Grand Teton National Park, others seek out the Snake River cutthroat, a colorful character found in its namesake river. In the fall, the spawning run of brown trout darkens the waters of the aptly named Miracle Mile in the North Platte River. Catch all four native subspecies of cutthroat and earn a Cutt-Slam certificate from Wyoming Game and Fish Department. Fishing in Wyoming is truly a unique experience. In the unspoiled wilderness, you’re likely to encounter more wildlife than other anglers, allowing you to find your own private fishing paradise. Click to view fishing properties.